Project Platypus took on a twelve month project of highlighting the value of the single paddock trees to farmers and the broader community, including protection of, awareness of and best practice management and care of the trees. We focused on humans and trees, with emphasis on the local eucalypts, the nationally listed threatened grey box & yellow box ecological communities . Various workshops and other events have been held over this period. 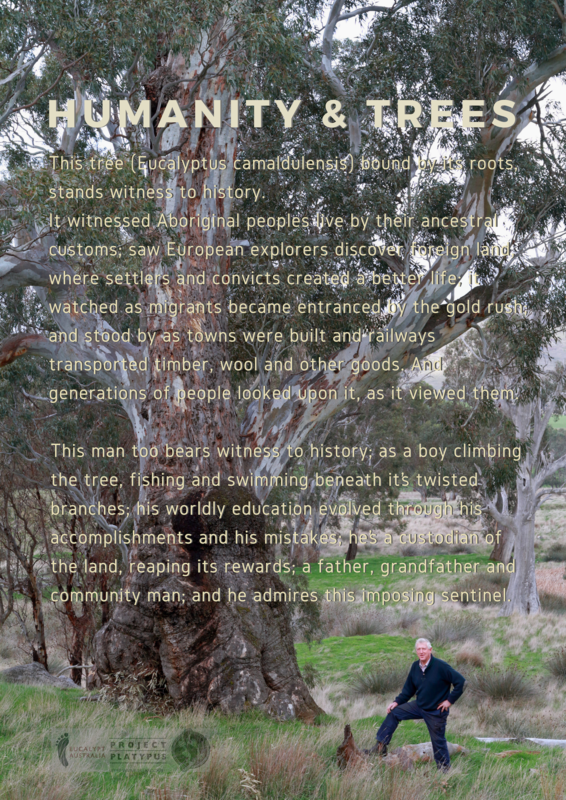 To understand better the human connection to trees we contracted Chris Tzaros to photograph various landholders and their trees of significance. These powerful images will be displayed at the Landcare Biannual forum in the Grampians, along with other information to support the imagery. The themes covered in the analogy of the relationship of humans and tree are: history, health and services (ecosystem). The entire project was made possible through funding from Eucalypt Australia.